DO NOT LIFT THE MACHINE FROM THE CARRIAGE OR THE MOTOR HEAD; LIFT IT FROM UNDER THE BASE. YOU MIGHT PERMAINENTLY DISTORT THE ALIGNMENT! MAKE SURE TO UNPLUG THE MACHINE BEFORE CHANGING THE BLADE, OTHERWISE SERIOUS INJURY COULD RESULT! KEEP FINGERS AND HAIR AWAY FROM SPINNING PARTS WHILE THE MACHINE IS IN OPERATION! DO NOT RUN THE CARRIAGE INTO THE SIDES OF THE BED – IT COULD GET STUCK AND CAUSE DAMAGE TO THE MACHINE! DO NOT RUN THE CARRIAGE SO FAST IT MAKES A WEIRD NOISE! DO NOT OPERATE THE MACHINE UNATTENDED! 1. Decide which blade thickness is appropriate for the hinging material/structure you are doing. Change the blade with the power cord unplugged. 2. Decide what angle is appropriate for the thickness of the board you will be slotting. Release the cam clamp and adjust the angle. 3. Position the board in the center of the carriage and evenly tighten both black board clamp knobs. 4. Using the carriage motor controller, position the blade where you want it to enter the board. 5. Adjust the height of the blade by turning the wheel at the top of the machine. By moving the carriage closer to the blade it is easy to position the blade accurately. 6. Lock the blade height using the brass knob facing you. 7. Turn on the vacuum dust collector. 8. Turn on the blade motor and crank the board to the appropriate depth, normally around three full turns, which is .150”. 9. Using the carriage motor controller, slot the board. If the blade is somewhat dull it may be necessary to slot the board in two or three passes, at less than full depth each time. To begin, there are only four basic adjustments you should have to make; the angle of the carriage, the height of the blade, the depth of the cut, and the speed and feed rates. This is determined by the material to be inserted and the structure. For example if you want two layers of material, one to be adhered to the spine, and one to act as a natural hollow, the slot thickness will be double. Generally this is around 13-15 degrees, but it can vary with the thickness of the board. On one very thin board I used an angle of 10 degrees, on very thick boards around 18. Ideally you want to end the slot close to the middle of the board’s thickness. I find that .150” holds very well with PVA. This is three turns of the carriage position wheel. Speed refers to how fast the blade is spinning, feed refers to how fast the carriage is moving, or in other words how the book board is fed into the blade. A good starting point is to set the Blade Speed to 3 o’clock, and set the carriage motor controller to number 3 or 4. I usually keep the blade motor and vacuum plugged into a surge protector, so that when you turn it on, both come on at the same time. I keep the carriage motor on a separate circuit, so you can move it into position without having the blade motor on. MAKE SURE TO UNPLUG THE MACHINE BEFORE CHANGING THE BLADE! First, the safety guards need to be removed by unscrewing the two thumbscrews that attach the guards to the motor. The blade can be changed with a 9/32” hex wrench. The nut is located under the blade. After unplugging the machine, simply hold the aluminum headstock spindle (where the belt is) and unscrew the hex head. The blade and bottom part of the holder can then be removed by pushing downward. The carriage can be moved back, away from the blade to give a little more room. Remember for all the nuts, screws and bolts on this machine. This is correct if the bolt is in front of you. In the case of the blade bolt, it in underneath the headstock, so as you look “down” at it you will need to turn it clockwise to loosen it. If you were looking up at the bolt in “normal” position, which is impossible because there is no room, turning the bolt counterclockwise would loosen it. So, to loosen the blade bolt, if you are looking down at it, you need to turn it clockwise. Blades range from 10-50 thousandths of an inch in HSS and there are two main blades in Solid Carbide, 1/64” and 1/32”. The 1/64” blade fits a linen/ tissue laminate, the 1/32” blade a double layer of linen/ tissue, if you want to build a hollow, for example. The carbide blades are expensive, but last a very long time (100 + boards in some cases) and can be resharpened. More information is at the end of this manual. The HSS blades are made for cutting metal and should last some time (around 10 boards), but if you find it continually overheats, and your speed and feed are slow, you should change it. If the blade becomes clogged with old adhesive be sure to clean or replace it, or it will burn the board. The thin .010” blade can easily deflect, so go slow. The teeth on the blades only cut one direction; make sure you don’t mount it upside down. On the left side of the machine, as you face it, loosen the cam clamp and position the carriage to the desired angle, from 0-20 degrees. Thirteen degrees seems pretty useful; Clarkson has some thoughts on this in his article. If the depth of the cut ends near the middle of the board four things are accomplished: there is the least chance for disturbing the covering material, the hinge is buried in the least deteriorated area of the board, the hinge is adhered on all three sides for the depth of the cut, and it is at a natural angle for swinging open. The slot angle must be established before the height of the blade is set. Sometimes loose or frayed covering material or pastedowns on the edge of the board make it difficult to find the optimal place to start your cut. If the pastedowns on the edge of the board are loose, I would recommend adhering them before slotting. By pin or blade–place a scalpel blade into the board where you would like to enter it, clamp it, and slowly raise the blade to it until it is in the right position. By measurement–dividers or numbers. If the board is thick enough, you can set dividers from the bottom of the board to where you want to make the cut, then transfer this by eye to the blade. If all else fails, you can always use a caliper to measure from the bottom of the board to where you want to make your cut; align the saw with the bottom of the carriage, then make your cut using the divisions marked on the hand wheel (50 thousandths of an inch per revolution). After the height of the blade is set, it is best to lock it in place by tightening the small brass knob located on the column above the label. The board must be clamped evenly to get a straight cut–tighten the left and right screws evenly, like using a lying press, and make sure the distance between the top bar and the carriage is even at both extremes. If the endsheet is detaching on the board edge it is best to repaste it before slotting. Or you can cut the slot first, and then cover it with the endsheet that was attached to the edge of the board. This makes a nearly invisible reattachment when viewed from the inside of the board. Clarkson has his own ideas on this, but I find a .150” deep slot holds very well with PVA. Perhaps if you use paste it should be around .200” A measure of .150” of an inch is three turns on the depth adjustment wheel that is located under the carriage, in the middle. It seems to work fairly well to slowly enter the cut three full turns, cut your slot, then back up the carriage to your original starting place to make one more pass to clean out the slot. The slot can also be cleaned out with an insertion tool, thin spatula or blunt needle. The speed of the cut depends on the depth, the nature of the material and the width of the blade. Slowing both the speed of the cut and the speed of the blade will prevent overheating, but going too slow is a waste of time. A clogged, dull blade will overheat much quicker than a new one. Again, Clarkson has some good advice on this, but a reasonable starting place is 3 o’clock on the blade motor speed, and number 4 on the carriage speed control. With a few practice boards, you will get a feel for how fast you can go. When cleaning out a slot after the initial cut, you can move the carriage much faster since it is not removing a lot of board. If the blade is spinning too slowly and the carriage moving too fast the blade can stall in the board, stressing the motor. If the blade is spinning too fast it can burn the board. It is always better to take a few extra minutes during the slotting process and err on the side of caution. Clarkson attaches the hinge to the spine before inserting it into the board. In theory, I think this is stronger and neater, but I find this to be very tricky, because you have to align the board to the text and fully insert the hinge at the same time. Often, especially with time constrained treatments, I insert the hinge (using the special thin tool provided) into the board first, let it dry, and then adhere it to the spine. Also, both boards can be dried at the same time. If two layers of material are too much for the spine, a frayed or overlapped joint near the middle can be made; I haven’t noticed any change in the spine movement when I have done so. If the text block is placed on top of the board when adhering to the spine, it is easy to check the squares for accurate placement. When the spine is dry, the hinge can be dyed, toned or covered for aesthetic reason. PROBLEM: The blade keeps burning the board. Check the blade under magnification for any dullness, usually recognizable by the rounding of the cutting teeth. Change the blade. Check the carriage and motor speed. Slow them down a little. Make sure you are cutting the correct direction- not “climb” milling. Make sure the height lock knob is engaged while you are making a cut. Try taking lighter cuts – instead of cutting the entire depth of the slot in one pass, try making two or three. Advanced solution – Make sure machine is aligned. PROBLEM: The blade doesn’t cut parallel to the board. 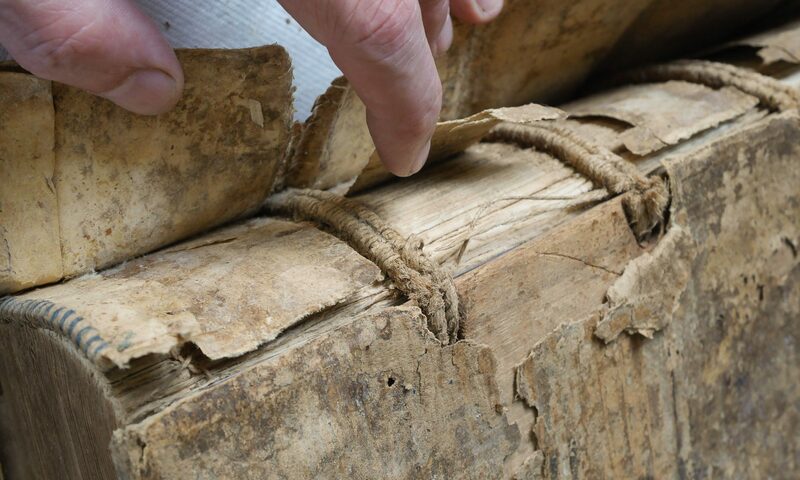 Make sure both of the finger knobs are tightened evenly and the book board is roughly centered. Make sure the blade is tight. Make sure the board is flat – many are not. Shim the board if necessary, or slightly position it at an angle in the carriage. Advanced solution – make sure the carriage is not out of alignment and shim if necessary (see DVD). PROBLEM: The blade cuts deeper on one end of the board than the other. SOLUTION: When clamping the board, make sure it is flush with the front and top of the carriage. You can feel the front of the board with your thumbs and position it with your other fingers. PROBLEM: The dust collector doesn’t clear the dust. SOLUTION: Check the suction strength on the vacuum, make sure the dust collector is positioned properly and the extra vents are sealed. PROBLEM: The blade motor shuts down. SOLUTION: The motor was stressed or became too hot. Let it cool for 10 minutes then you should be able to restart it. PROBLEM: The blade is stuck in the board and will not turn. SOLUTION: Turn off both motors, and crank the blade out of the board. Slightly increase the blade motor speed and reenter the slot. PROBLEM: The carriage seems to wiggle. SOLUTION: The gibs need to be tightened. See “Maintenance” section of this manual. PROBLEM: The blade stops turning when engaging the board. SOLUTION: Make sure the belt from the motor to the cutting head is tight, if necessary loosen the two hex head screws on the bottom and slide the motor to tighten. PROBLEM: The board I want to slot is not flat. SOLUTION: You can shim parts of the board to support it, and use “Biscuit” slotting technique. PROBLEM: I have trouble aligning the blade. PROBLEM: There is surface rust on the steel dovetailed beds. SOLUTION: Wipe with a thin coat of oil and steel wool or a Scotchbrite pad. PROBLEM: When do I change the blade? SOLUTION: It depends, but I would check the blade visually each time, and keep track of how many boards (or more accurately how many board inches) have been slotted if many people are using the machine. 10-15 boards seem around the average before the blade is significantly dull. The new carbide blades can last around 100 boards. PROBLEM: I try to set the angle, but it keeps slipping. SOLUTION: Tighten the two nuts on the right side of the carriage, on the other side of the cam clamp that is used to set the angle. I don’t recommend using the HSS steel, except in the very thin (.010”), since a carbide blade is not available, and some very thick ones, which are useful for repairing wood boards. 1. The tooth geometry is better suited to the abrasive nature of binders board. 2. The teeth are much coarser (around 36 teeth per blade vs. 100 or so for the old ones), so they do not clog up. 3. They are made of solid carbide, instead of High Speed Steel. They are more rigid, and from what I have read last 5-20 times as long as the HSS blades. I haven’t completed my tests yet and worn one out. They run very cool. 4. The company that makes the blade can resharpen them for 35-40% of the original cost. Similar solid carbide cutters were developed for the manufacture of rolled paper tubes. They have a Rockwell “C” Scale Hardness of 90 (!). I talked to an engineer at the company and he seemed to understand the extraordinarily abrasive nature of paper products. A. 1/64 inch (approx. .016” or .41mm) perfect for a single layer fabric/ tissue laminate. B. 1/32 inch (approx. .031” or .79mm) perfect for a double layer fabric/ tissue laminate. I have bought 2 of each thickness, that way I can always have a sharp one on hand and send the other back for regrinding. A large institution may need more. The company says they have a 2 week turn around time for resharpening. The company that makes and resharpens the blades is Johnson Carbide (Tel. 989-754-7496). Syringes and blunt end needles are available from Small Parts. Peachey, Jeffrey S. “New Possibilities for Board Slotting”. The Bonefolder, Vol. 2., No. 2. Simpson, Edward. “Setting up a Board-Slotting Programme” The Paper Conservator, Vol. 18, 1994. Pp .77-89. Zimmern, Friederike. “ Board Slotting: A Machine-Supported Book Conservation Method” The Book and Paper Group Annual, Vol. 19, 2000. Pp. 19-25. Zimmern, Friederike. “21.8 Board slotting- a machine-supported book conservation method,” Conservation of Leather and Related Materials, ed. Marion Kite and Roy Thomson. Oxford: Butterworth-Heinemann, 2006. Pp. 236-243. -This is a slightly expanded version of the 2000 publication of the same name. If the vertical plane should ever happen to go out of alignment, the easiest way to fix it is to loosen two of the bolts that attach the entire carriage to the wood base, and insert some brass shim stock at the low end. If the horizontal plane is a little out of alignment, three of the four bolts can be loosened and the carriage moved slightly. It is a good idea to periodically grease the threads of the motor column and carriage bed with a white lithium grease. If some surface rust develops on the steel parts, lightly rub them with a Scotchbrite pad or 000 steel wool and some oil, like 3-in 1. The Formica can be cleaned with a damp rag or commercial cleaning products. Tightening the gibs: the gibs are the angled rubber pieces that keep the carriage from twisting, yet allow it to slide. If the carriage seems to have some play in it, the setscrew that holds the metal part to control the depth of the gibs can be loosened, and they can be slightly tapped with a small hammer to tighten; then retighten the setscrew. If, for some reason, the blade holder needs to be removed, loosen the 7/16” hex bolt on the top of the motor column two or three turns, then tap the bolt downward. The entire blade holder should then slip out downward. It is held in place by the 7/16” draw bolt. It is a good idea to periodically check all the nuts and bolts to make sure they are still tight, especially the ones on the carriage motor, which are located on the bottom of the machine. The manufacturer warrants the Peachey Board Slotting Machine to be free from defects for one year. This warranty covers parts and labor. If there are problems, please contact Jeffrey S. Peachey for instructions on repair or return information. If, after a reasonable number of attempts the machine still does not work properly, it will be replaced, or a refund offered for the purchase price of the machine, excluding any workshop/installation/delivery fees. This warranty does not cover parts that wear out in the course of normal operation – saw blades, belts, gibs, motor brushes, etc. This warranty does not cover any consequential damages that may occur, e.g. burning a book board.